Welcome to the world of light diffraction! These affordable, yet high quality glasses immerse your eyes into a spectrum of colors. Throw these glasses on and jump into a sea of rainbows! The intense diffraction effect of these glasses can be seen when viewing any light source. The soft lens design allows us to offer a remarkably low price, but don’t underestimate incredible diffraction effect of these glasses! GloFX Standard Diffraction Glasses diffract more light than competitors’ glasses that retail for nearly twice as much! Choose right the first time. Choose GloFX. Our GloFX Standard Diffraction Glasses will have heads turning wherever you go. GloFX’s quality diffraction eyewear is great for the young and old alike. Get crazy with this sleek new style and show everyone how colorful life can be. 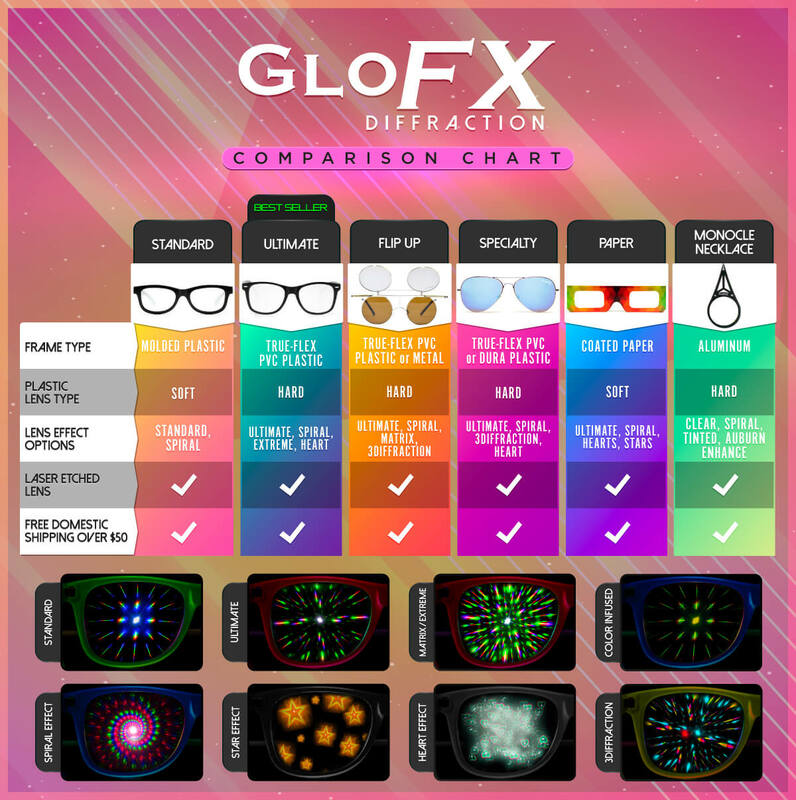 Check out GloFX’s light diffraction glasses for your next party, event, or show. I bought these to go to a rave with some friends and they were amazing! Everyone wanted to wear them. These are definitely the best ones I have tried out. I have to buy some more since mine got lost! SO damn trippy! It’s cool that a pair of paper firework glasses were included too.